Want to stay healthy and fit? Not interested in going to the gym or exercising indoors? Then mountain biking is the solution and many of us choose that as our preferred way to relax as well as exercise. Out of all the top bikes we’ve ever reviewed there are a number on this list that are of amazing quality, regardless of your budget. Get yourself a durable and sturdy mountain bike from the variety of quality bikes available in the market and take on the journey. Mountain bikes are an inexpensive and thrilling solution that offers much-needed exercise coupled with numerous health benefits and a taste of adventure. So, with so many options available in the market, which bike to exactly choose and why? Here is the list of the five top mountain bikes under $500 so you can get the best of rides yet not be overly burdened by the price. Available for under $500 in three impressive colors, black and red, gray and green and white and red, the Merax Finiss 26 is regarded as one of the best mountain bikes. The bikes they manufacture possess all the features that a biker is looking for is a mountain bike. With a weight of only 33 lbs, the Merax Finiss 26 Aluminum is a durable and lightweight bike made with 6061 Heat Treated Aluminum frame. The frame which has gone through extensive heat treatment is resistant to heat and stays in top notch condition in any weather. The hi-tech 26″ wheel rims allow for easy movement of the bike and rolling of the wheels. It also gives added support when riding through tough terrains. The Shimano 21-speed bikes Derailleurs and Shifters give a sturdy and swift shifting of the bike. It is very necessary when taking quick turns and shifts on various bumps on the mountain. The essential mechanical brakes and 80mm suspension fork provide for complete support and safety when traveling on unsafe and unreliable landscapes. 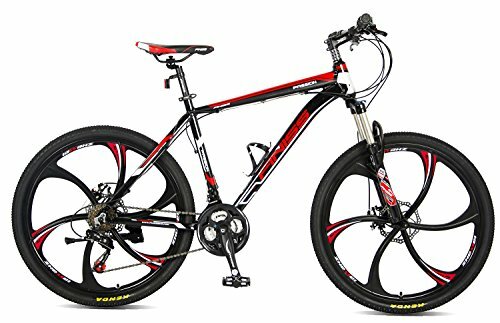 The 26″ allow high profile rims for power control and incredible grip, accompanied with other remarkable features make Schwinn Protocol 1.0 Men’s one of the top full suspension mountain bikes on the market. The Schwinn state of the art engineered dual suspensions with aluminum frame offers high durability and complete shock absorbing. The sturdiness of the frame is the key when biking on mountains. 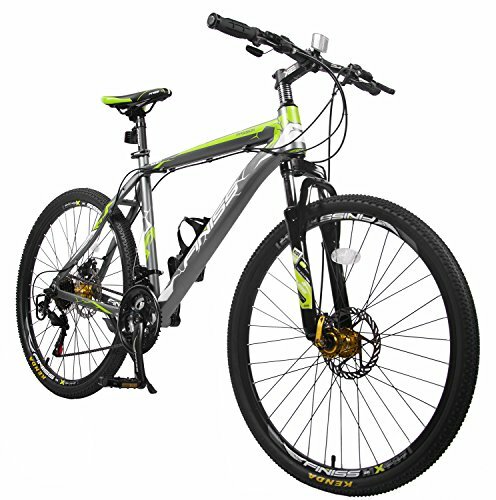 Furthermore, this value for money mountain bike has top-notch pro max front disc brakes for enhanced care of the biker. It offers a quick bike control when the urge to stop and ride is sudden. The MTB handlebar is robust and does not negatively affect the posture of the rider. It is adequately positioned and adjustable when required plus it has trigger shifters which provide much-needed suspension when moving in various directions and pathways. 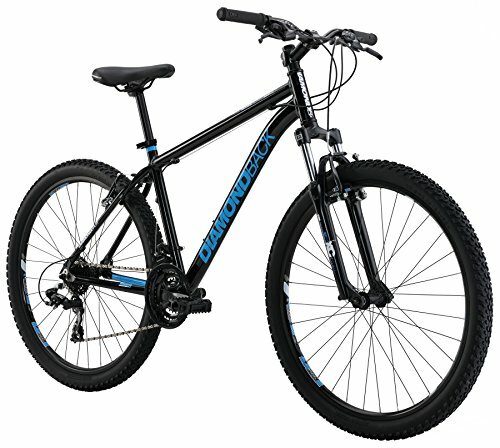 Diamondback Bicycles Sorrento is famous for producing classic mountain bikes with innovative features and it is elegant. The Diamondback is a rugged mountain bike that can endure the test of weather and bumpy surface. The heat-treated aluminum frame and solid suspension forks help this terrible mountain bike in sustaining every type of condition. Moreover, the bike offers multiple adjustable frame sizes of 16-22 inches for people of all heights. The rider would not have to worry about it being compatible with their height and weight. The SRAM trigger shifters offer high power in overcoming difficult blocks and obstacles during steep hill adventures. Plus, the double wall alloy rims guarantee a stable and comfortable ride on rough pathways. Nashbar AT1 29er Mountain Bike has made a name for itself for designing and producing top quality mountain bikes and the AT1 another impressive entrant into their portfolio. The striking red color of the AT1 is accompanied with durable and stiff aluminum frame and 75mm fork suspensions. The hardtail frame and super quality suspensions allow the rider to have a comfortable and shock-less ride even on the toughest of terrains. The 7-speed drivetrain presents vast gear options for the user when riding on any type of surface, mountain or flat. Equipped with V-brakes, the speed can be easily controlled and the bike can be halted on demand. Furthermore, the large and wide 29″ wheels give the rider the liberty to cross any hurdles on their journey. There is hardly any mountain bike that can beat the finesse and design of Merax Finiss mountain bike. Firstly, the bike is extremely light in weight, with a weight of 34 lbs, it is extremely portable which is a very handy feature of it. Moving forward, Finiss is manufactured with front and back disc brakes which are important when it comes to safety and keeping the speed in check. Especially when going down the hill, with 80mm, the Finiss has one of the largest fork suspensions in the market. They assist in captivating shocks and makes the ride as smooth as possible. With a price, well below $500 and having three color options to choose from, the Finiss is hard to beat. There are several factors that need to be considered before opting for the best mountain bike. The first and foremost is the budget. 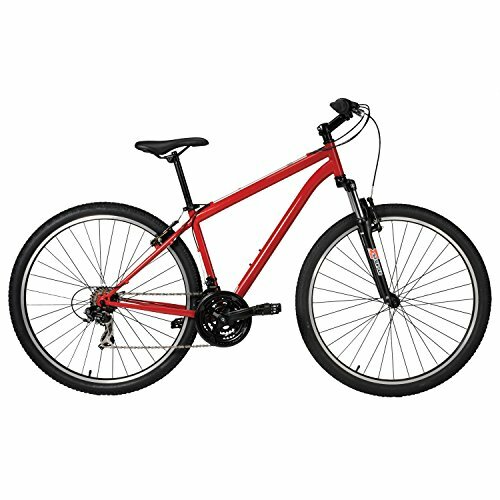 Therefore, all the above-mentioned mountain bikes are well below the $500 mark. Once the price is sorted there are these following factors that need to be kept in sight before choosing the right bike for you. There are three types of mountain bikes, the rigid which does not have any suspensions, the hardtail bike which has fork suspensions at the front and full suspension which has both front and rear suspensions. A mountain bike that has adequate suspension ability should be bought, based on the type of adventures that you might want to take. 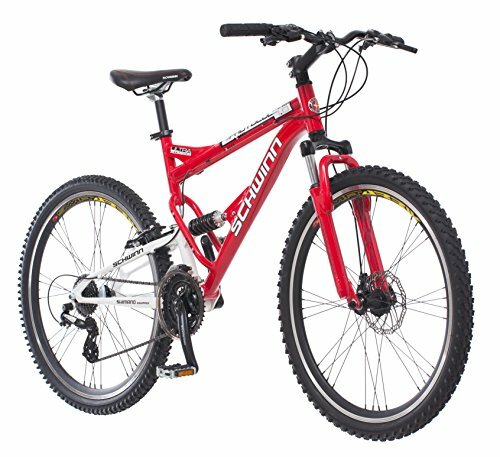 Around 5 various wheels sized mountain bikes are available in the market. The wheel size that you choose should be dependent on the terrains you explore, mountains or hills. The larger the wheel, the easier it is to overcome difficult blockades and obstacles. Almost all mountain bikes have an aluminum frame these days. The durability and material of the aluminum used needs to be checked. Some are lighter than others. There are also other frame material options in the market such as steel, titanium and carbon fiber but the best and most ideal is the aluminum frame which is heat tested. Though mountain biking does not require frequent changing of gears but having a 7-speed gear system can be very helpful. It mainly depends on the strength of your body, if you are well built and seasoned biker than even the lower gears would assist you on going up or down. If you are a rookie than you would be needing higher gears to get you to your destination. This is an essential part of a mountain bike. The number of times the brakes are applied while mountain biking is countless. There are mainly two types of brakes, disc brakes, and rim brakes. Disc brakes are powerful brakes in all kinds of conditions and very easy to replace. While the rim brakes are, the conventional brakes attached to the rims that offer solid grips but not in all weathers. But the first question that comes to the mind is what is the best bike for your budget and how is it different from a hybrid bike? Mountain bikes are tailor-made for rough and tough surfaces. They are designed and manufactured with modern day technology to combat any type of surface they are riding on. From the frame to gears, from the wheels to rims, from the brakes to shifters, everything is produced with a particular consideration for mountains and hills. The framework is specifically designed for the comfort of the rider. It is accompanied by high-quality shock absorbents that provide the necessary safety. When riding on uneven surfaces, the constant bumping can put a considerable amount of strain on the back and neck. A good mountain bike should have many features and one is high shock absorbent features, which are well-equipped to endure any and every kind of pressure exerted on them. We have compiled the best bikes under $200 that would be light on your pocket and would serve the purpose as well. Though all have numerous advantages such as solid frames, large wheels, 7-speed gears, etc. but they also possess a few drawbacks. You mainly need to look at the type and the frequency with which you would ride them. This would help you in making your decision. Either way, a mountain bike is a great outdoor exercise that has a lot of benefits for anyone that takes it up. So, happy biking!